Old hitters such as Albert Pujols are contributing less than in years past, but it doesn’t appear to be because pitchers are throwing harder. Although Major League Baseball’s audience is old enough to give golf a run for its erectile-dysfunction ad dollars, its player pool is skewing younger each year. Research suggests that players are peaking — and declining — more quickly, placing them in their primes ever earlier. It’s no coincidence that young stars such as Bryce Harper and Carlos Correa seem emboldened this spring, openly advocating a more demonstrative style of play. This is their game; modern MLB is no sport for old men. 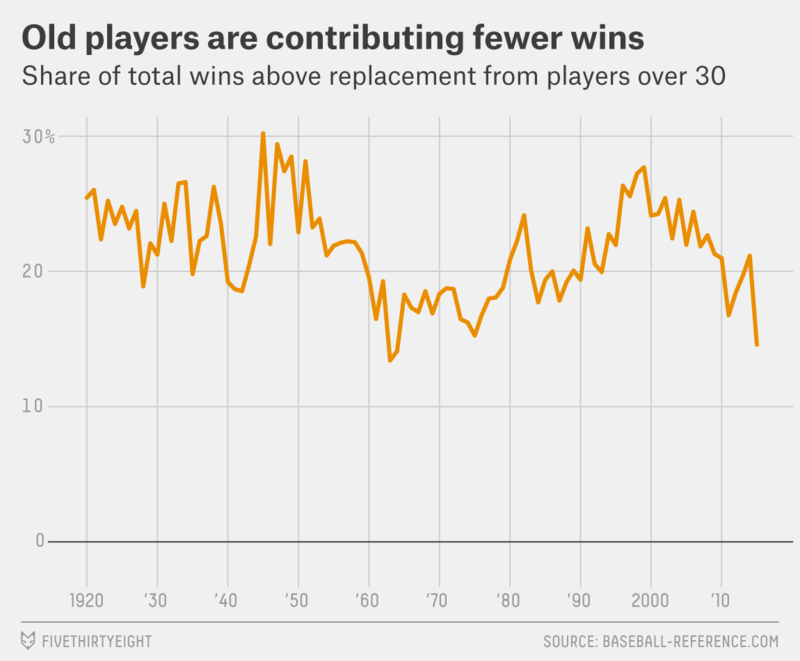 As the game has gotten younger, it has also picked up the pace — and not just between pitches. The average (four-seam) fastball has sped up by about two miles per hour over the last decade, incinerating countless chyrons along the way. In the eight full seasons for which we have complete PITCHf/x data, the proportion of MLB fastballs topping 93 mph has increased by almost 50 percent, with the percentage breaking 95 mph nearly doubling and the share above 97 mph nearly quadrupling. In a recent edition of his newsletter, Sports Illustrated contributor and Baseball Prospectus co-founder Joe Sheehan drew a connection between these two trends, speculating that faster pitches are forcing older hitters into early retirement. Sheehan’s proposal sounds plausible. 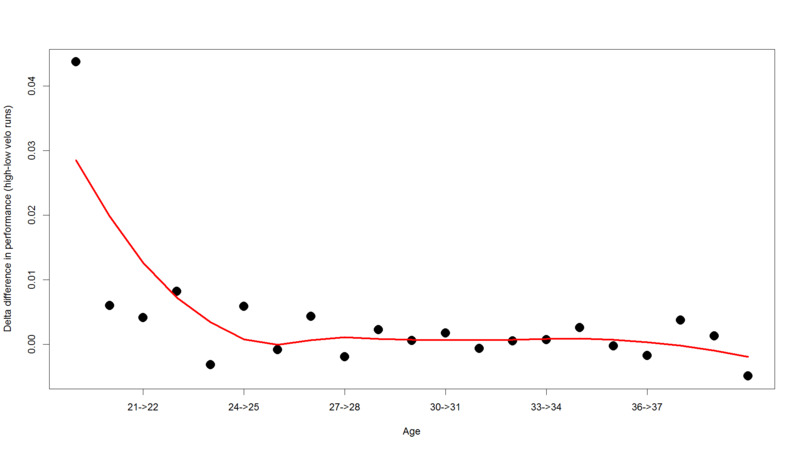 Reaction time is known to decrease from a peak at approximately age 24. Faster pitches leave hitters less time to react. It seems intuitive, then, that older hitters would have a tougher time adjusting to baseball’s current hard-throwing conditions. The green “against high velocity” line is consistently lower than its orange counterpart, which tells us that faster pitches are generally harder to hit, regardless of the batter’s age. (No surprise there.) 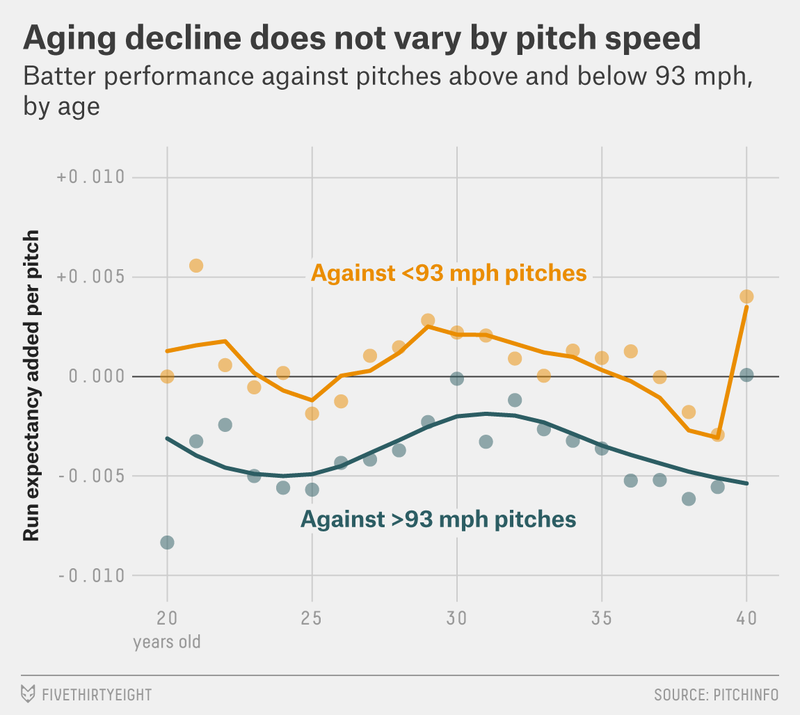 But the gap between the two lines stays constant as a batter gets older, suggesting that age doesn’t necessarily make it harder to catch up to fast pitches. If old hitters are at a greater disadvantage against gas, it’s not showing up here. We can even try to corroborate the theory in indirect ways. If aging batters were “cheating” against good fastballs, for instance, starting their swings early to mask delayed reactions, we would expect them to be more vulnerable to pitchers who are adept at changing speeds — yet hitters don’t decline any more quickly against pitchers with especially large speed separations between their fastballs and nonfastballs. Similarly, if veterans couldn’t catch up to good fastballs, we would expect pitchers to exploit that weakness by throwing more of them to older hitters than younger ones — but batters barely experience an uptick in the percentage of 93+ mph pitches they see over time. 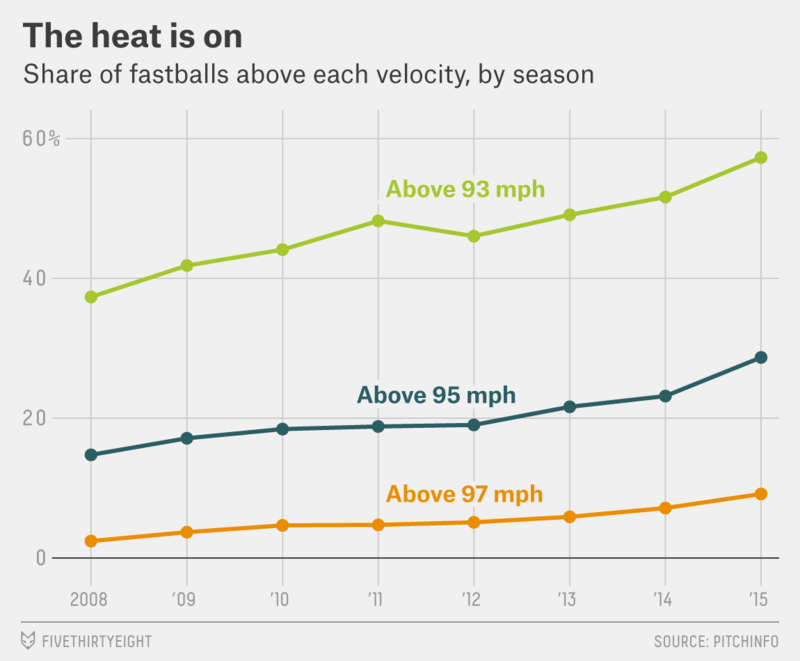 More anecdotally, many of baseball’s best fastball hitters aren’t exactly spring chickens. 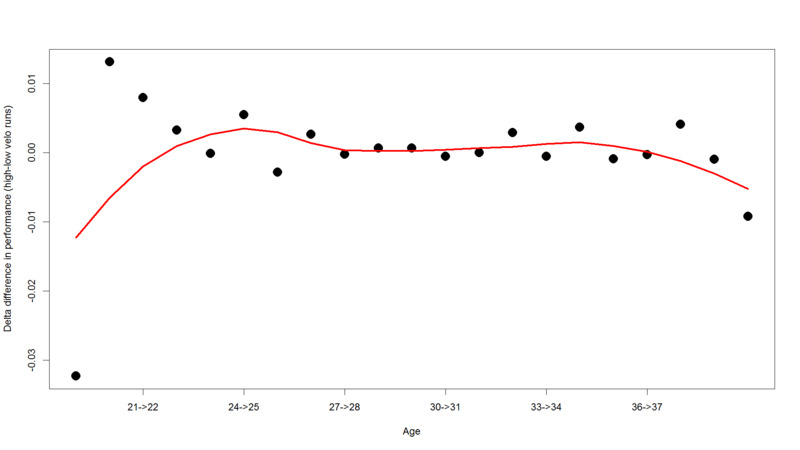 Last year’s 10 best hitters against fastballs topping 95 mph3 had an average age of 31.2 and included Mark Teixeira (age 35), Jose Bautista (34) and Carlos Beltran (38); only 24-year-old Nolan Arenado checked in at or under the aforementioned peak age for response time. 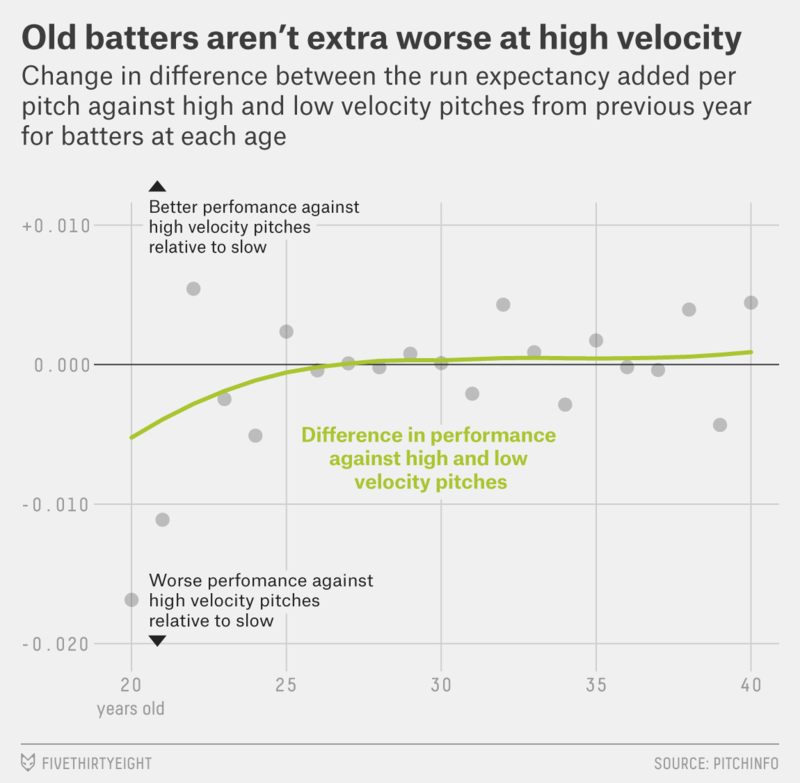 So why wouldn’t older hitters be burned most severely as pitchers turn up the temperature? Although slowing response speed probably contributes to age-related hitting declines, it likely affects performance against all pitches. (It’s not as if any major league offerings were easy to hit.) In addition, the same study that pegged peak response time at 24 noted that older competitors can compensate for a loss in response speed with strategies born of experience. 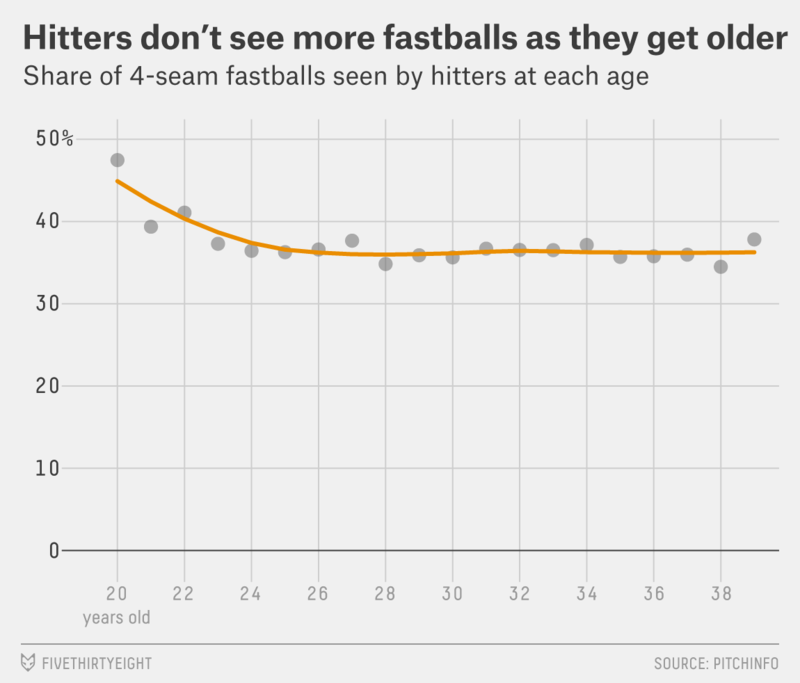 For instance, older hitters could be better at anticipating fastballs, which would help them offset slowing bat speed. And while decrepitude eventually comes for all players, the ability to catch up to good fastballs may not be the first (or the worst) thing to go. Declines in durability, stamina and muscle mass may combine to claim careers before hard-throwing pitchers start to take a higher toll. Admittedly, we may also be missing something. It’s almost impossible to eliminate selection bias from aging studies in sports, because players who decline quickly disappear from the sample. In this case, though, we believe that bias would be slight, in part because we’re focusing not on overall performance against fastballs — which does a lot to determine whether a hitter’s career continues — but on the difference in performance against fastballs of certain speeds. So, sorry, Joe: for better or worse, access to servers can’t confirm this appealing hypothesis. Some sports mysteries still resist the neat narrative, no matter how many stats we have on our side. Pitch classifications and data come from Pitch Info. 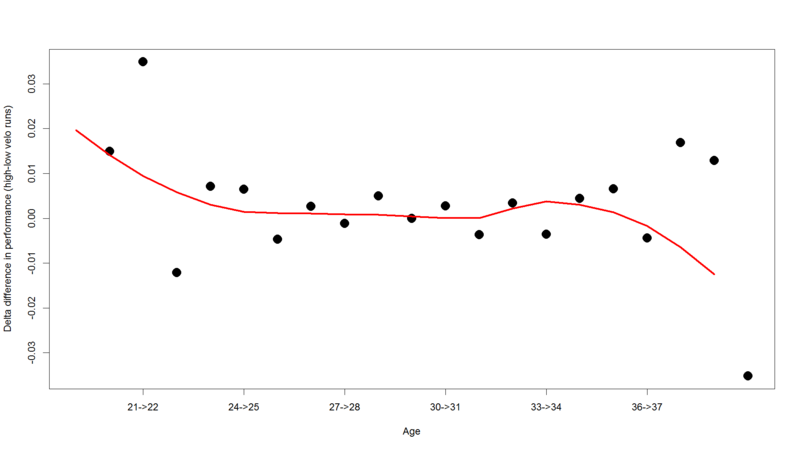 The aging curves against fastballs above 95 and 97 mph, respectively, do show slight drop-offs, but they don’t come until a hitter’s late 30s, long after most bats begin to fade. The same is true of the 95-mph trend line even with sinkers and cutters included. Among players who saw at least 1,000 fastballs of any speed.